The Sheet Closet by Sandra Orgel from Womanhouse. Photo courtesy of Through the Flower Archives © 1972. After finding a number of answers to her questions about teaching she then focused exclusively on her art until 1999 when she revisited her art teaching methodology. A series of teaching projects with distinctly different contexts provided Chicago with teaching experiences that helped her to articulate a clear vision of her teaching methodology, which is still uncommon to many university art programs. In June 2003, Judy Chicago set out the framework of her teaching methodology and titled it, Participatory Art Pedagogy Informed by Feminist Principles, in discussion with Donald Woodman, who as Judy’s life partner had collaborated in the teaching projects with Judy since 1999. Together, over many years, they had recognized the distinct components of their teaching. Dr. Karen Keifer-Boyd, associate professor of art education at Penn State University, participated in the June 2003, three-day dialogue. Karen provided insights from listening to Judy and Donald, and from visually mapping what she heard, and from her experience as a feminist art teacher and understanding of feminist theory and pedagogy from years of research and reflective practice. 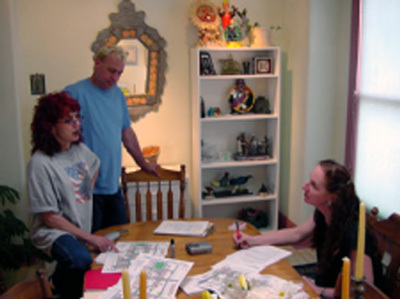 The Envisioning the Future project in fall 2003 is the first time that Judy Chicago and Donald Woodman have taught their teaching methodology to others.